The “Falling-Asleep” or “Repose” (“Dormition”, “Uspenie”, “Koimesis”) of our Most Holy Lady Mother of God and Ever-Virgin Mary. 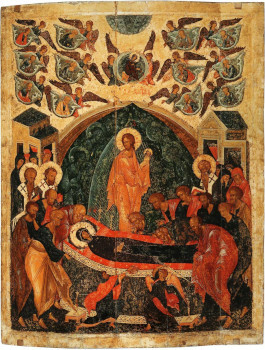 The circumstances of the Falling-Asleep or Dormition of the Mother of God were known in the Church from times apostolic. Already in the First Century, the Hieromartyr Dionysios the Areopagite wrote about Her “Falling-Asleep.” In the Second Century, the account about the bodily Assumption of the Most Holy Virgin Mary to Heaven is found in the works of Meliton, Bishop of Sardis. In the Fourth Century, Saint Epiphanius of Cyprus refers to the tradition about the “Falling-Asleep” of the Mother of God. In the Fifth Century Sainted Juvenal, Patriarch of Jerusalem, told the holy Byzantine empress Pulcheria: “Although in Holy Scripture there be no account about the circumstances of Her end, we know about them otherwise from the most ancient and credible tradition.” This tradition in detail was gathered and expounded in the Church history of Nicephoros Kallistos during the Fourteenth Century. At the time of Her blessed Dormition, the Most Holy Virgin Mary was again at Jerusalem. Her fame as the Mother of God had already spread throughout the land and had aroused against Her many of the envious and the spiteful, who wanted to make attempts on Her life; but God preserved Her from enemies. Day and night She spent at prayer. The Most Holy Mother of God went often to the Holy Sepulchre of the Lord, and here She offered up incense and the bending of knees. More than once enemies of the Saviour sought to hinder Her from visiting her holy place, and they besought of the high-priest a guard to watch over the Grave of the Lord. But the Holy Virgin Mary, unseen by anyone, continued to pray in front of them. In one suchlike visit to Golgotha, the Archangel Gabriel appeared before Her and announced Her approaching transfer from this life into the Heavenly life of eternal beatitude. In pledge of this, the Archangel entrusted Her a palm branch. With these Heavenly tidings the Mother of God returned to Bethlehem with the three girls attending Her (Sepphora, Evigea, and Zoila). She thereupon summoned Righteous Joseph of Aramathea and other disciples of the Lord, and told them of Her impending Repose (Uspenie). The Most Holy Virgin prayed also, that the Lord would have the Apostle John come to Her. And the Holy Spirit transported him from Ephesus, setting him alongside that very place, where lay the Mother of God. After the prayer, the Most Holy Virgin offered up incense, and John heard a voice from Heaven, closing Her prayer with the word “Amen.” The Mother of God took notice, that this voice meant the speedy arrival of the Apostles and the Disciples and the holy Bodiless Powers. The Disciples, whose number then it was impossible to count, flocked together, says Saint John Damascene, like clouds and eagles, to hearken to the Mother of God. Seeing one another, the Disciples rejoiced, but in their confusion they asked each other, why had the Lord gathered them together in one place? Saint John the Theologian, greeting them with tears of joy, said that for the Mother of God had begun the time of repose unto the Lord. Going in to the Mother of God, they beheld Her augustly lying upon the cot, and filled with spiritual happiness. The Disciples gave greeting to Her, and then they told about their being miraculously transported from their places of preaching. The Most Holy Virgin Mary glorified God, in that He had hearkened to Her prayer and fulfilled Her heart’s desire, and She began speaking about Her immanent end. During the time of this conversation the Apostle Paul likewise appeared in miraculous manner together with his disciples: Dionysius the Areopagite, wondrous Hierotheos, and Timothy and others from amongst the Seventy Disciples. The Holy Spirit had gathered them all together, so that they might be vouchsafed the blessing of the All-Pure Virgin Mary, and all the more fittingly to see to the burial of the Mother of the Lord. Each of them She called to Herself by name, She blessed them and extolled them in their faith and hardships in the preaching of the Gospel of Christ, and to each She wished eternal bliss and prayed with them for the peace and welfare of all the world. There ensued the third hour, when the Repose of the Mother of God was to occur. A multitude of candles blazed. The holy Disciples with song encircled the felicitously adorned sick-bed, upon which lay the All-Pure Virgin Mother of God. She prayed in anticipation of Her demise and of the arrival of Her longed-for Son and Lord. Suddenly the inexpressible Light of Divine Glory shone forth, before which the blazing candles paled in comparison. All that saw took fright. Sitting atop as though immersed in the rays of the indescribable Light, was Christ the King of Glory Himself come down, surrounded by hosts of Angels and Archangels and other Heavenly Powers, together with the souls of the fore-fathers and the prophets, formerly having foretold of the Most Holy Virgin Mary. Seeing Her Son, the Mother of God exclaimed: “My soul doth magnify My Lord, and My spirit rejoiceth in God My Saviour, for He hath regarded the lowliness of His Handmaiden,” and, getting up from Her bed to meet the Lord, She bowed down to Him. And the Lord bid Her come enter the habitations of Life Eternal. Without any bodily suffering, as though in an happy sleep, the Most Holy Virgin Mary gave up Her soul into the hands of Her Son and God. Then began joyous Angelic song. Accompanying the pure soul of the God-betrothed and with reverent awe for the Queen of Heaven, the Angels exclaimed: “Hail Thou, Full-of-Grace, the Lord is with Thee, blessed art Thou amongst women! For lo, it be the Queen, God’s Maiden doth come, take up the gates, and with the Ever-Existent take ye up the Mother of Light; for of Her is salvation come to all the human race. Upon Her ’tis impossible to gaze and to Her ’tis impossible to render due honour” (Stikherion verse on “Lord, I have cried”). The Heavenly gates were raised, and meeting the soul of the Most Holy Mother of God, the Cherubim and the Seraphim with joy glorified Her. The graced face of the Mother of God was radiant with the glory of Divine virginity, and of Her body there exuded fragrance. Miraculous was the life of the All-Pure Virgin, and wondrous was Her Repose, as Holy Church doth sing: “In Thee, O Queen, the God of all hath wrought a miracle, that transcendeth the laws of nature. Just as in the Birth-Giving He did preserve Thine virginity, so also in the grave He did preserve Thy body from decay” (Canon 1, Ode 6, Tropar 1). Giving kiss to the all-pure body with reverence and in awe, the Disciples in turn were blessed by it and filled with grace and spiritual joy. Through the great glorification of the MostHoly Mother of God, the almighty power of God healed the sick, who with faith and love gave touch to the holy cot. Bewailing their separation on earth from the Mother of God, the Apostles set about the burying of Her all-pure body. The holy Apostles Peter, Paul, James and others of the Twelve Apostles carried the funeral bier upon their shoulders, and upon it lay the body of the ever-Virgin Mary. Saint John the Theologian went at the head with the resplendent palm-branch from Paradise, and the other saints and a multitude of the faithful accompanied the funeral bier with candles and censers, singing sacred song. This solemn procession went from the Sion-quarter through all Jerusalem to the Garden of Gethsemane. With the start of the procession there suddenly appeared over the all-pure body of the Mother of God and all those accompanying Her a vast and resplendent circular cloud, like a crown, and to the choir of the Apostles was conjoined the choir of the Angels. There was heard the singing of the Heavenly Powers, glorifying the Mother of God, which echoed that of the worldly voices. This circle of Heavenly singers and radiance moved through the air and accompanied the procession to the very place of burial. Unbelieving inhabitants of Jerusalem, taken aback by the extraordinarily grand funeral procession and vexed at the honours accorded the Mother of Jesus, denounced this to the high-priests and scribes. Burning with envy and vengefulness towards everything that reminded them of Christ, they sent out their own servants to disrupt the procession and to set afire the body of the Mother of God. An angry crowd and soldiers set off against the Christians, but the aethereal crown, accompanying the procession in the air, lowered itself to the ground and like a wall fenced it off. The pursuers heard the footsteps and the singing, but could not see any of those accompanying the procession. And indeed many of them were struck blind. The Jewish priest Aphthoniah out of spite and hatred for the Mother of Jesus of Nazareth wanted to topple the funeral bier, on which lay the body of the Most Holy Virgin Mary, but an Angel of God invisibly cut off his hands, which had touched the bier. Seeing such a wonder, Aphthoniah repented and with faith confessed the majesty of the Mother of God. He received healing and joined in with the crowd accompanying the body of the Mother of God, and he became a zealous follower of Christ. When the procession reached the Garden of Gethsemane, then amidst the weeping and the wailing began the last kiss to the all-pure body. Only towards evening time were the Apostles able to place it in the tomb and seal the entrance to the cave with a large stone. For three days they did not depart the place of burial, during this time making unceasing prayer and psalmody. Through the wise providence of God, the Apostle Thomas had been destined not to be present at the burial of the Mother of God. Arriving late on the third day at Gethsemane, he lay down at the sepulchral cave and with bitter tears bespeaking loudly his desire, that he might be vouchsafed a final blessing of the Mother of God and have final farewell with Her. The Apostles out of heartfelt pity for him decided to open the grave and permit him the comfort of venerating the holy remains of the Ever-Virgin Mary. But having opened the grave, they found in it only the grave wrappings and were thus convinced of the bodily ascent or assumption of the MostHoly Virgin Mary to Heaven. On the evening of the same day, when the Apostles had gathered at an house to strengthen themselves with food, the Mother of God Herself appeared to them and said: “Rejoice! I am with ye — throughout all the length of days”. This so gladdened the Apostles and everyone with them, that they took a portion of the bread, set aside at the meal in memory of the Saviour (“the Portion of the Lord”), and they exclaimed also: “Most Holy Mother of God, help us”. (This marks the beginning of the rite of offering up a “Panagia” (“All-Blessed”) the custom of offering up at meals a portion of bread in honour of the Mother of God, which even at present is done at monasteries). The sash of the Mother of God, and Her holy garb, – preserved with reverence and distributed over the face of the earth in pieces – both in past and in present has worked miracles. Her numerous icons everywhere issue forth with outpourings of signs and healings, and Her holy body – taken up to Heaven, witnesses to our own future mode of life therein. Her body was not left to the chance vicissitudes of the transitory world, but was all the more incomparably exalted by its glorious ascent to Heaven.